What's the big deal about a deformed toolholder? When a standard retention knob is installed in a toolholder, the threads place a torsional stress onto the thin walls of the toolholder. This stress causes the deformation of the precision taper of the toolholder and prevents the toolholder from properly mating with the spindle of a CNC machine. This expansion can reduce taper contact by as much as 70% and, therefore, no longer meets the AT3 taper tolerance specifications. An expanded toolholder leads to poor tool-life, harmonics, run-out, poor finishes and shortened spindle life. Through studies, we have found that when a toolholder is properly mated with the spindle, carbide tool-life can be increased by 10% to 300%. The image above shows how a High Torque retention knob prevents the toolholder from expanding. The HT knob is longer than a traditional retention knob, but shares the same head dimensions. The additional length increases durability of the High Torque retention knob; a standard retention knob has less shank elasticity and will fatigue faster. The extra length of the knob is added to the shank of the knob below the flange. This relief, along with a precision pilot and controlled threads, allows for the stress to be distributed into a deeper cross-section of the toolhoder where it has more resistance, thus preventing the toolholder from expanding. Please see our High Torque Retention Knob page for more information. Why does a standard retention knob deform a toolholder? When a standard retention knob is installed into a toolholder, the threads create torsional stress that deforms the thin walls of the toolholder. A retention knob is like a fastener or screw in that it relies on four threads of the fastener to be installed to reach 'full engagement.' The first engaged thread from the flange carries the most stress; the balance of stress is unevenly distributed through the threads with the last thread having the least amount. This uneven stress distribution is placed on the narrowest cross-section of the toolholder and deforms the small end of the toolholder. This taper deformation prevents the toolholder from having full taper contact with the spindle. What difference does it make if my toolholder is deformed? When should I replace my retention knobs? 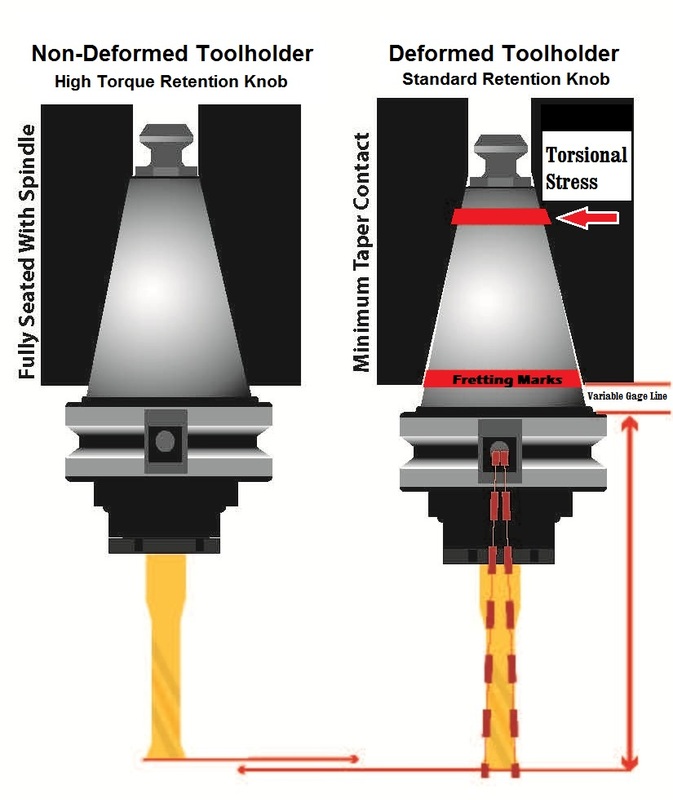 The retention knob is something that is often overlooked, yet it is the most critical connection between your machine and tooling. A question we often receive is ‘How long is a retention knob designed to last?’ A general rule of thumb is that a pull stud has a lifespan of about 3 years. This is for shops that run standard 5 day/week, 8 hour shifts. If the shop is running 24 hours a day, the retention knob is only good for one year. Using a retention knob that has been marked with a part number, serial number, lot number, and date can help you track the life cycle of the pull stud. 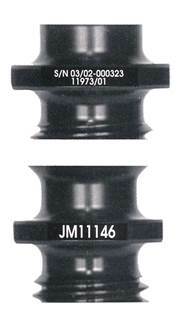 At JM Performance Products, we have been manufacturing retention knobs for over 20 years and we laser mark all of this information right on our retention knobs. In the event of a broken retention knob, this information can help you and the retention knob manufacturer determine what may have happened. Other signs to look for on a worn retention knob are wear marks from machine grippers or ball bearings. Also, once a retention knob becomes too fatigued the pull stud can develop cracks. When these signs are prevalent, it’s time to change your retention knob. If a pull stud breaks during engagement, this can damage the work piece along with the machine spindle. Examining your machine’s retention knobs can also help you determine other problems going on inside your machine. A retention knob can show if there are signs of a tool that has slipped in the spindle or if a drawbar needs to be rebuilt. With the average spindle repair costing $5,000 to $50,000, plus machine downtime, the retention knob is an item that needs to be evaluated in your facility. When is the last time you examined the retention knobs in your facility? We will be at IMTS booth W-2197 answering questions on retention knobs and demonstrating our new products. We'll be covering topics on how to reduce machine variables, improving tool life and increasing machine uptime. The value of trade shows…. We didn’t always exhibit at industrial trade shows. To be honest, we didn’t invest much time or money in trade shows, even as attendees. That all changed when we officially took the step from being a job-shop to manufacturing our own product…retention knobs. The first year, we more or less dipped our toe into the water of some smaller, local shows. We didn’t have much in the line of show “assets”; no real display, just some colorful informational hand-outs, and the knobs. We adapted and evolved with each show, learning that you don’t have to take everything including the kitchen sink, instead, taking what exposure taught us was the important stuff. We think we look pretty darned professional now when we hit the show floor. It seems as if everyone has the "best" product you can buy. Whether it's a car or a can of soup, the marketing people will tell you their product is the BEST. But they're not so quick to tell you why theirs is the best. They hope that the consumer will take their word for it; that they'll obligingly buy into the claims and blindly believe the hype. And, since the approach is so wide spread, it must be effective. Maybe we haven't been loud enough in our claim that our High Torque retention knobs are the best retention knob you can buy. Maybe we need to buy a late-night advertising spot on a national television station and have a spokesperson gesture madly while yelling the message out to the viewers. Or maybe we should just continue to do what we've been doing: making a claim and supporting it with facts. Let's start with how our knobs are manufactured. We use 8620H hot rolled steel to produce most of the knobs, although tool steel is also used to make knobs that are used in the most demanding applications; we shot peen the parts to relieve stress; the knobs are deburred; our knobs have better finishes than the International Standards require; we maintain written inspection records on everymanufacturing lot; and they are made in the USA from materials manufactured in the USA. Is that what sets our retention knobs apart from all the others? Honestly, not ALL the others, but quite a few of them. What makes our High Torque knobs different, and superior to the others, is that our knobs are designed and manufactured to eliminate problems that are precipitated by a standard retention knob. Simply put, a normal retention knob has the tendency to expand the top of the toolholder once it's installed, creating a distortion of the toolholder. This distortion is amplified by the application of torque pressure during installation. The distortion prohibits the tool holder from fitting properly in the spindle, resulting in movement of the toolholder during the milling process. The resultant effect of this movement is translated as run-out,vibration and increased harmonics, shortened tool life (especially in the case of carbide tools), poor finishes, spindle wear and tear, lower feed rates, and decreased rigidity. By lengthening the thread portion of the knob, eliminating unnecessary threads, and cutting the threads to start and finish at 180 degrees to each other, not only is the distortion problem resolved, but the retention knob is balanced which increases the overall balance of the toolholder. That's a whole laundry list of problems, and let's face it, expenses, fixed by the lowly retention knob and just a few bucks extra.